File this house under “They don’t make ’em like this any more.” The stunning Queen Anne Victorian was built in 1897 in Osceola, Iowa, and is listed on the National Register of Historic Places. It’s known as “The Banta House” and was designed by the popular Victorian-era architect George Barber. The house has 4 bedrooms, 4 baths, 3 fireplaces, and 3 porches. Take a look! It has only had two owners since it was built, which is pretty amazing for a house of its age (114). This is called “The Greeting Room.” I like the sound of that. The listing says the house has 2,423 square feet, which surprises me. It looks larger than that from the outside. The formal dining room has potential with the big windows and the fireplace, but I’d love to see the carpet pulled up. George Barber sold about 20,000 house plans during his career, marketed worldwide through mail-order catalogs. Over four dozen Barber houses are now listed on the National Register of Historic Places. Thanks to Amanda for finding this one. She says, “I am dying to know what is behind that attic dormer window above the tower.” Me, too! For more photos and information, check the listing. Oh, my! Julia!!! This is so beautiful! So charming! There’s so much I’d do with it. I truly love this home! Wow! This one is breathtaking Julia! I have been blogging about Victorian period dramas recently and this house made me want to swish around on that porch in one of those gorgeous hoop-skirt and bustle creations. It looks like it has been well preserved and would only need a loving touch to bring it up to date and back to life. It has great “bones”. Thanks for another fantasy house! I love to see these beautiful Victorian ladies restored!! My sister lovingly completed one in Paola KS a few years back. wow, that square footage looks wrong to me too…although the rooms seem much smaller than I thought they’d be. It’s in great condition; it’s really been renovated and also taken care of! Wow, that house is so beautiful and charming! I have no idea what I would do with it, but my head is spinning with ideas. I’m usually not a fan of stained wood trim, but I kind of like it in this house. It just seems to fit. That bedroom did crack me up though, with the wallpaper border and matching comforter. That would probably be the first room I’d want to get my hands on, immediately followed by the front parlor. The Victorians wallpapered every room, even the ceilings. The patterns were much darker than we like today and a little too busy for my taste. Possibly the floors are so much lighter than the trim because it is a different wood. I would hate to see the kitchen go modern. I think there is plenty of room in it to add today’s conveniences without losing it’s Victorian charm. It is beautiful! I wish I could move it to my corner of the world. Thanks for sharing. I don’t know how feasible this would be..but… I would make it into a B&B. It would make a great place to host weddings. They really have kept it well. Yes, a few color changes and carpet removal….but otherwise, pretty wonderful! I LOVE the kitchen, just the way it is! And the bath, with all that wood! I just love unpainted wood. Such a beauty! I live in Des Moines and would be willing to take a drive to see it in person. Thanks so much for sharing! What a beautiful house! You can see there is a free standing garage with loft as well. It looks like there is a good size of property with the house. They just don’t build them like they used to. What really floored me is the price: $300,000. You couldn’t buy property and build a house half that size with the quality of materials, basement, high ceilings, garage etc. ANYWHERE! What a beautiful Victorian home! It does need some updating, but it should be done carefully in order to maintain the charm of the home. I would definitely get rid of all of the wallpaper, and the carpet in the dining room. I absolutely love the exposed stone walls in the basement, and the “greeting room”! I might have to move to Iowa. That wallpaper in the front parlor is giving me a headache. It reminds me of those seemingly abstract patterns where you have to focus and unfocus and cross your eyes and move closer or away from the page and maybe, just maybe, you might find the hidden image. What’s the hidden image in the wallpaper — “Strip me!!!”? Not my style, but the parlor wallpaper is very Victorian appropriate for a house where someone has done a proper period restoration. LOVE this!! Ever since I was a kid I’ve wanted a Victorian like this. I have 4 kids, 3 of which are girls, and I can see them loving that attic!!! I can’t believe how cheap this house is to buy! If I lived close by I’d snapple it up. I’d get rid off all of the carpets and wallpaper, both of which I loathe, first, then start from there. Such a cool project! Wow, this house is stunning, absolutely stunning. My maternal Grandparents were both from Osceola, Iowa. I’ve been to that part of Iowa many, many, many times. I was pleasantly surprised at the interior of the home. (You should see some of the run down homes in surrounding towns and countryside. It’s heartbreaking.) I would get rid of the wallpaper and carpeting. The woodwork is beautiful and the house has been lovingly maintained. It’s in incredible shape. What a gorgeous house! If the cabinets are falling off of the hinges, I would try and restore them because they are in great shape. Then I would take down the wallpaper and takeout the carpet. Other than that, the house is in great shape. I love it!! And I loved seeing your sweet little face in ‘the follows’…thank you! This home needs a new owner with a very delicate touch…especially in the kitchens and baths. I’d have to tackle anyone who’d make it look “builder-ie” by removing the character and adding newer, sterile finishes…which is so criminal in any historic home. It looks like it wouldn’t take to much really to fix it up, just a little care and thoughtfulness…the bones are so beautiful…very ‘Meet Me In St. Louis’. Well I’ll be darned – a house in Iowa! How cool. Please to the person that buys this place….don’t paint the woodwork white…. Gorgeous house but that wallpaper is making me sick. What would I do with it? I’d start by hiring someone to strip the wallpaper. I know that it’s authentically Victorian to have dark, busy wallpaper, but we don’t have to embrace that look, do we? I thought the purpose of all that dark wallpaper was because coal fires and gas lighting made the walls horribly dirty. If the Victorians didn’t have those problems, they may have preferred light, clean spaces. Maybe it’s just the photo, but the kitchen seems very narrow and cramped. I might be tempted to bump it out onto the porch, or even annex the porch–if that’s a side porch and not the front–for a more spacious, open kitchen. The carpet, of course, must go. I know people love to preserve natural wood finish. I would definitely hesitate before painting the trim white in this house, but all that dark wood seems oppressive to me. I’d probably paint all the walls white and leave the trim and hope that lightened things up. And maybe choose painted furniture and white-slipcovers on chairs and couches to brighten things up and break up all that wood. Ugggg…… that is like my dream house, what I have always wanted and so cheap too!!!!! can you feel my frustration??? I would change a few things but not much. What would you do with this house if you could get your hands on it? Beautiful Victorian. Looks like it may need a new roof, which would be expensive. I would have all wood floors and add a lot more color everywhere. The Victorians used wallpapers all over their homes, a lot were geometric, surprisingly. I think when you buy a Victorian home, it looks silly to have modern furniture in it, so I would use Victorian couches and chairs or covered couched, slipcovered. 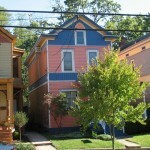 But, lots more color, as the Victorians loved color. Julia, I’m w/ you as far as the updating goes! Good eye, asking about the flooring .. something a bit darker would be more fitting, I think. I like some of the kitchen, too .. some of those cabinets match the paneled door; such rich wood patina! Can’t get that these days.. but some of the other cabinets look newer, don’t you think? what a great house!! it has everything, just needs a little direction. i love the brick wall in the kitchen and the stone wall in the basement. OMG!!!! i LOVE this home!!!! the only thing i would do (seeing it from pictures) is take off the wallpaper and take the brick out of the kitchen! is there a shower in any of the bathrooms? Love it! And you’re right–they don’t make them like this anymore! Overall, I like the interiors as are, but this house is definitely wallpaper-challenged. In the kitchen, I wouldn’t touch ANY of the woodwork (ditto for the whole house,) and would replace the counters. Pull up any carpet and replace any light colored flooring with medium-to-dark (preferably vintage). I’m also amazed this place has had only two owners. Hi Julia this house is beautiful BUT the wallpaper has to go and the carpet sorry….. Leave the woodwork alone it’s beautiful. Love the kitchen and bathroom. I do love the Georgian style where do you have those and do you like the style? Regards Esther from Sydney with lots and lots of rain. I have 8 Plumeria trees they have grown well so far I do hope they survive this winter. I would leave the woodwork alone as well and repaint. The kitchen cabinets are so pretty I would not harm them in any way. Just add some nice period furniture, remove the carpet and it is all good. I would love to see the attic as well. I wonder if the Queen Anne style will ever come back into fashion enough for us to see whole developments of this style! What a breath taking place! Wonderful house, minus the decor, that is! Just by reading this post I have discovered that the “Jeremiah Nunan” house in Jacksonville, Oregon, was also one of George’s designs. It was number 143 in his portfolio. My hubby lived in the house when he was a teenager. His parents paid a song for it and even then, back in the late sixties, made some money on it when they sold it, but……nothing like what is being asked for it now! You can see it by Googling the “Jeremiah Nunan House.” I would recommend to you posting a photo of it here on your blog. It’s now a B and B and wedding venue and it’s gorgeous. Beautiful house with huge potential for someone far braver than me ! I reckon it would be far too creepy at night to live in ! The outside of this Victorian is swoonfully gorgeous. The inside falls flat, but wow, the outside is spectacular. I would love to get my hands on this beauty. I could work some magic inside and really increase the value by making it show better. They need a stager for sure. I grew up on Osceola and have been in this house. There are rumors that this house was once used as a stop for the underground railroad. It is truly breathtaking and my childhood dream home. The pictures do not do this house any justice. how did you get in this house? this is my family’s house. Did you know Frank Eli Manning, or any of the Fowlers? Hopefully the fact that it’s on the Register will keep anything like “paint the woodwork” or “rip out the kitchen” from happening. This is one of the houses that should be kept period, I think. I might stip the wallpaper, but only to add back a slightly lighter period/reproduction design. The attic is probably a sewing room attached to the servant’s quarters – good light. A house this size would have had a ‘staff’, even in the midwest. Or possibly a nursery with an attached bedroom for the nanny. This house belonged to my husband’s great, great aunt. His dad was raised in this house by his aunt, Mary Banta. Mary’s sister, my father-in-laws, mother died and Mary helped raise him. My husband has been in and played in the house as a child. He said that the door in the kitchen lead to the attic, which is where they all played. It is such a beautiful house with lots of memories. We would love to purchase it and keep it in the family but I can’t see that happening right now. Bonnie is my sister-in-law. how funny. yes, this is our house. the doors in the kitchen went t0 the basement or outside. the scary door was upstairs. which led to the attic. Would either of you happen to have any old or historic photos of this home? I am researching and documenting the architect of this grand home, and I would love to include any historical documents or photos you might be aware of, in my documentation. I would be very interested in any original drawings, plans, specifications, or correspondence by the architect. Thanks. This is my Dad ‘s house. Ed and Mary Banta! and no one pronounces it right. it’s no b anta, it’s “bawta:. Did gr-grpa’s son go to Iowa after returning from Civil War? My Banta history book only goes back to the 1890’s. Does anyone know why to urge to move to Iowa? What business were the Banta’s in? One branch of the family went to Florida then to Pennsylvania and started the Banta Refrigerator Co. Have misc. info on that branch. if anyone still wonders, that awful wallpaper was not part of the house as I knew it. And, sorry, I meant to say Bawnta, Bahnta. It is not Banta, with the harsh sounding ‘a’. The attic was filled with family belongings, trunks full of clothing, old toys. And, yes, it was fun to explore. I spent the night in one of those rooms as a child. My family was moving away and we had sold our house and had nowhere to stay that last night. The people living in it, who were friends of my parents, invited the whole family to spend the night. First time I had a room to myself. The basement was used as an office for the gal living there. I remember the little hedgehog door stop that she used. I believe she was the realtor that is selling the house now. ….what a beautiful house/home. My fiancé and I are selling our Circa 1800 Victorian in Rahway, NJ….move-in condition and oh so beautiful. If interested in receiving details on this rare beauty, please call Lorraine 908-868-2222.